← WHEN DOES BABY STOP BELLY CRAWLING? Thanks, Lilly’s Mommy, for asking one of the most frequently asked questions by moms in my classes. You observed your daughter very carefully and discovered that she is getting stuck in the movement from her side to her belly because her arm is in the way. In the above exercise that you refer to, observe how the baby is holding a small toy. She is holding a small toy that can not poke her in the eye. This toy helps her arms to be in one of the useful positions for learning to roll. The incorrect position of the arms for rolling is when baby is on her belly and the arms are straight out to the sides like an airplane where they can be bent backward as she rolls onto her back. Please avoid this position of the arms. If you try this baby exercise you may want to give her a soft toy to hold in her hands. Roll her in very small increments. Begin rolling her from her back to her side, where she is comfortable. Then go a bit further, then a little bit further. With each repetition you can increase the range of motion about 1/4 an inch. This gives you the chance to make sure her arm is not in he way. If you want to send a video to me I can be more specific about it, but I do not know exactly where her arm is getting stuck. (Videos remain confidential.) Or, you might try a virtual lesson with me. Developmental play for babies is where parents and caregivers interact with babies in a manner that evokes the next developmental pattern. For example, saying “Ba,Ba” and then pausing for baby to repeat after you eventually results in baby learning to say the sound “Ba!”. Looking at a book with baby and pointing out the doggies and saying “dog,” “dog,” and “dog” teaches her to say the word “dog” herself. Soon, she will pick up the book and point to everything and say “dog.” These are examples of baby play for speech development. 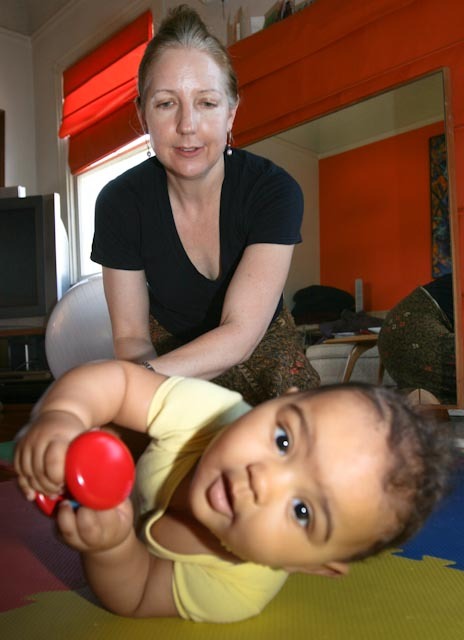 Movement developmental play is where you show baby how to improve a motor skill in a playful way. For example, when baby is on her back, you can bend her legs and put her feet down on the floor so she can push and scoot backward. This is the motor skill of scooting. This movement is a fun surprise to her. She did the movement, not you. You just gave her the clue! It is a fun game for her that develops her strength in her legs and the ability to push off of the floor. This is developmental play through movement. This is what we do in these lessons. Through showing her with your hands where to move her baby arms when she rolls is developmental play. To just keep her stuck and wait until she magically figures it out is to assume that all babies will learn to roll, which is not true. Many babies never roll, many babies never crawl, etc. Or they reach a state of frustration before they learn the skill. Sometimes a clue from us regarding the coordination of the movement is all that is needed. It is to their advantage to learn these skills with ease and play. Through our guidance they can master their motor skills with joy. This ability to learn motor skills through ease and with coordination and skill develops a strong self-image. This entry was posted in ROLLING and tagged 3-6 months, coordination, locomotion. Bookmark the permalink.